On Mothers’ Day I feel most comfortable assuming the role, not of the mom, but of the daughter. Of course I own up to the fact that I am the mother of two sons and deeply cherish all that those two rascals have brought to my life. Never one to wallow in sentiment (like my father in that respect, but so unlike him in other ways) I have nonetheless fondly preserved nearly every gift that the boys have given me over the years. 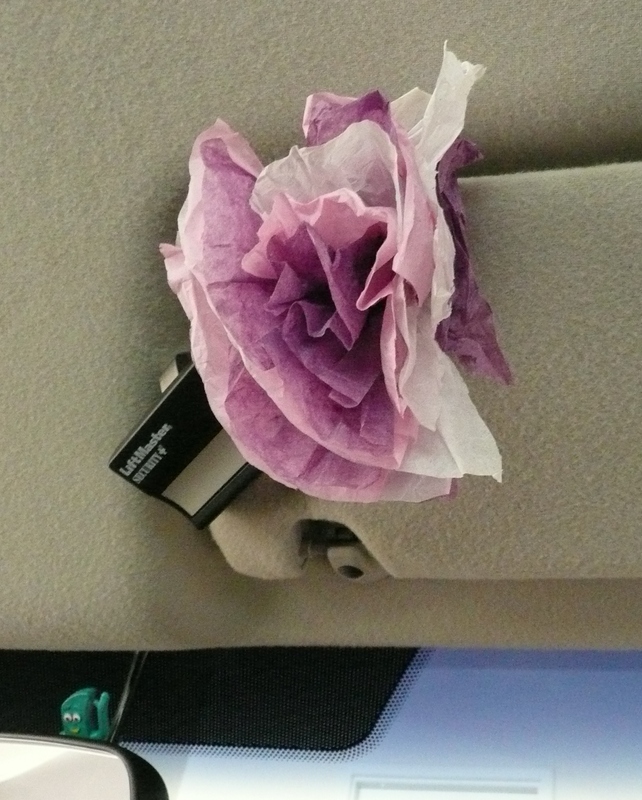 This is a crepe paper flower from Harry that serves as a good luck charm hanging from the passenger side visor of my car. Yes that’s Gumby. This is a bear-spoon-flower from Harry. Don’t ask. 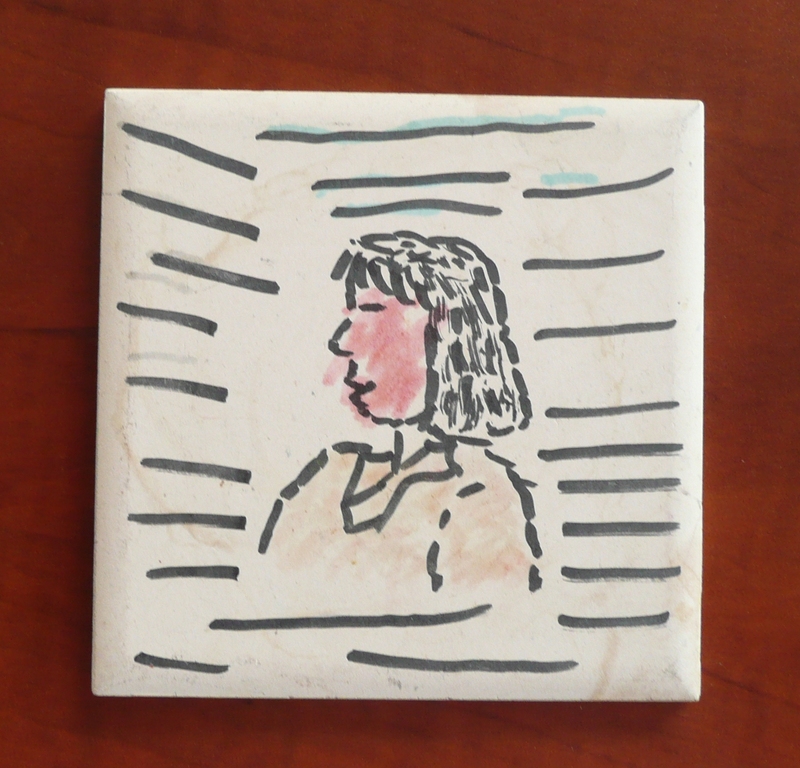 This is a portrait of me rendered by Nick on a ceramic tile, and as you can see from the brown rings, used as a coffee mug coaster. Mercifully for him, he has other wonderful talents. Have I mentioned that he is the World’s Best Beat-Boxing Actuary? There is one infamous gift that I couldn’t show you because it is in a box buried beneath, what else, cases of stashed yarn. One day Harry came home from school covered with gack. He had globs of white stuff smeared all over his clothes and shoes, in his pockets, under his fingernails, stuck in his hair, even some in his ears. It took major soaking and scrubbing and complaining before we got him reasonably clean. A few days later on Mothers’ Day, I learned what all the mess was about. A well-meaning teacher in Harry’s class helped the kids make plaster hand prints for their moms. Right. Thanks. I keep that sweet little hand print to remind me how memory is selective. We remember the good and forget the gack. My mother is also a saver of keepsakes. I never knew how many seemingly inconsequential things she had kept, probably without my dad knowing. Dad was a so-not-sentimental kind of guy, practical in all ways. He could not imagine wanting to collect anything (and never in a million years would he have understood the concept of yarn stashing). There wasn’t room in his life or his home for too much stuff that wasn’t useful or needed right now. It’s not that he would throw things out for no reason, because he abhorred waste. It’s just that his concept of waste applied to wasted space as well. Just after my dad died, whether she was feeling her own mortality and needed to pass on some of her belongings while she could or whether she just wanted to clear out some of the old junk and make room for new junk, Mom went through most of the attic and gave me dibs on anything I wanted to take away, with the implied threat that anything I did not claim would end up in the trash. How could I refuse such an offer? From among the souvenirs, mementos, knick-knacks, crates of mis-matched china, stacks of her hand-embroidered linens, she pulled out a tattered piece of thread crochet. I remembered seeing that doily on top of Mom’s dresser when I was a kid, but that was many decades and nearly as many dressers ago. It was the only bit of crochet in there and, as I was to discover during my research later, the only piece of crochet from her original trousseau that survived. My mom was about to toss it in the trash pile, but something made me stop her. Fast forward a few years. I had begun a career as a crochet designer and was working on my first book, Amazing Crochet Lace, the introduction to which is a huge tribute to my mom. Naturally, I had to include an image of the vintage doily that I saved from the attic that day. I had planned to create a garment design based on the thread motif she used, but publishing being what it is, that exploded motif vest ended up on the cutting room floor so to speak. I had seriously run out of real estate (book pages) and had to set the idea aside. Fast forward another few years. I received a call for designs from Piecework, the sister magazine to Interweave Crochet. Piecework delves into the history of needlework, all types of needlework. I had never thought to submit any of my crochet designs for publication there because none of my work actually has any history. But something made me revisit the attic doily. 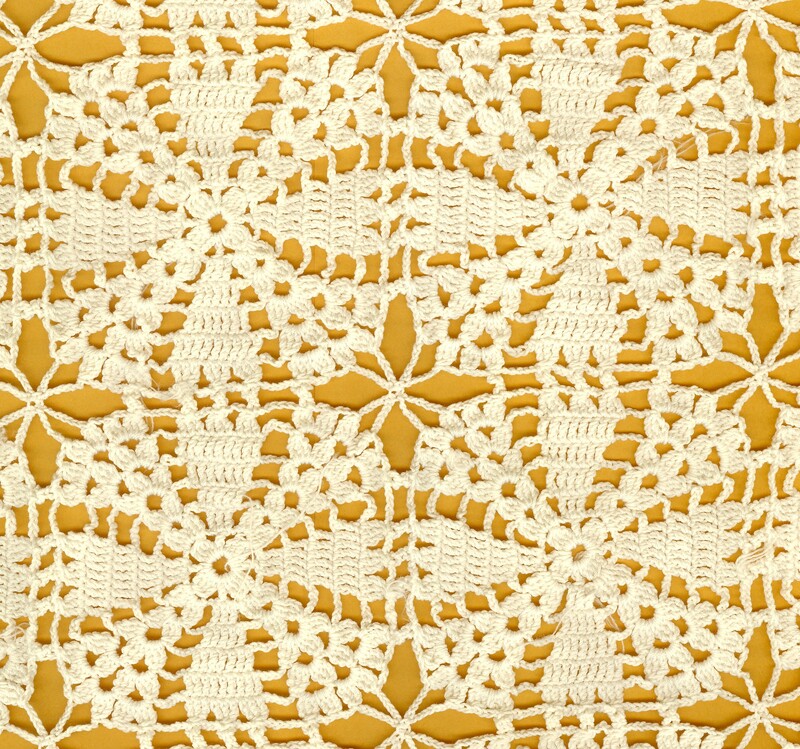 I called Mom and through our conversation I pieced together the story of her crochet, this doily and my proposed design. This time I kept the concept simple. This time the pattern came in under three pages! 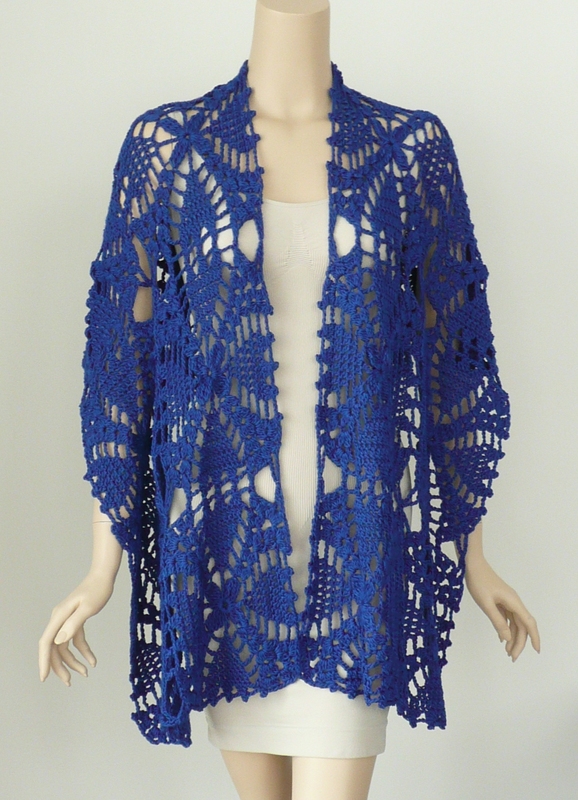 This time the idea took off and the result is Yokohama Mama, featured in the current Spring 2011 Lace issue of Piecework. Although the Yokohama Mama project and the accompanying little history I wrote could be considered a Mothers’ Day gift from me to my mom, for me it will ever be a treasure that she gave me, a tiny seed rescued from the attic that she planted in my heart and encouraged to grow. 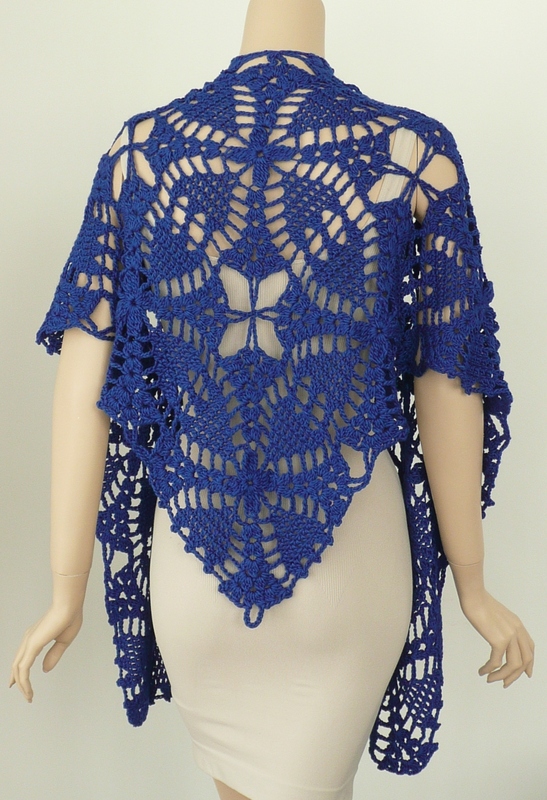 This entry was posted in backstory, crochet, Designer's Life, published design by dorischancrochet. Bookmark the permalink. Wow! A beautiful story and a beautiful piece. I have fond memories of my Mom crocheting many fuzzy white angora capelets, circa 1960…but my best memory is her sitting in the middle of an evolving cotton crochet rug of many colors which I took with me to college and my first home! I think my love for fiber comes from her, a sort of DNA connection! Thanks for the story (and my Mom is a Doris, too!)! Oh Doris, that is gorgeous…both the story and the resulting piece. Wow! I loed the shawl when I saw it on my first “page through” of the magazine, but was blown away by the story. Thanks so much for sharing that piece of your history with us. As usual, you have combined two of the things you do so well: crochet and memoir. Just lovely on both counts. Wow Doris!! That’s a very touching story! And a wonderful piece too like all your other works :). My mom taught me crochet and knitting and even tatting and whatever little interest I have today in creative craft, I owe it to her!! Thanks so much for sharing this story. Crochet is a craft that often links the generations and it’s the stories behind it that make it even more special! What a lovely story and a lovely piece of wearable history. Thank you for sharing it! Even though I knew some of this story before – to read the whole thing together and to see the beautiful crochet design that grew from that historical seed – is love in the making. You’re a wonderful daughter, mother and friend! I have been a fan of your designs since I saw you on the Creat channel. I’n a leftie and My dear sister bought me three of your books when I was in recovery frome hip replacement surgery.I have been trying to learn you methods from tne the books but with limited sucess.Do you possibly have a group of classes? Your designs are so loose and flowing ,I want to make them. I started on the shawl in the last week – it works up really fast as I can work 2 squares in an evening easily. Unfortunately, I do not have time every evening to work on it. It’s looking lovely already. Thank you for such a lovely story and pattern.